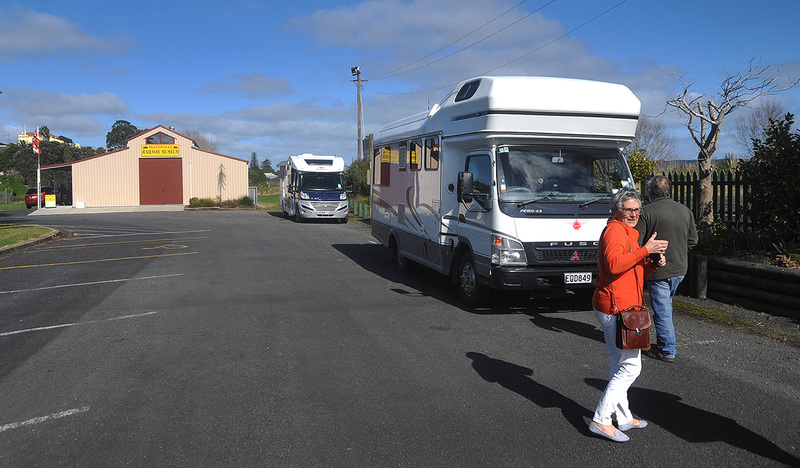 Our friends Rob and Helen were keen to get out to play Motorhomes and we were keen too! As the weekend weather was looking pretty naff, we thought somewhere local would be the ticket. After some false starts, we settled on Pinewoods at Red Beach. I last came here a year ago and back then they were setting out some new concrete parking for Motorhomes. Thats all done now and it looks great and apparently they’ve been working really well. So well that they’re looking at putting some more in. 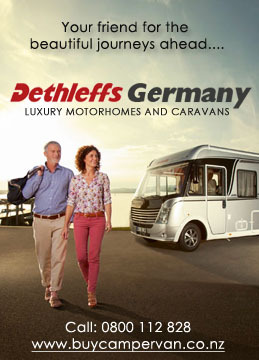 Pinewoods is run by a company of Bach owners and the Motorcamp is run as part of this. The showers and access to a nice TV lounge, and Kitchen are included in the price. There is also a coin operated Laundry for those who need this. The forecasted weather was bang on and it was naff but we had a nice time in Rafe for happy hour. Helen had made a nice Lasagne and we added some chicken and bits so we moved to the Tracker later. A great fun night. The best table Tennis table I’ve ever seen! Early in the morning, I went for a walk around to see if I could get some updated piccies around and after that the others went for a look around. Right at the top of the camp, there are some well fenced concrete steps which run down the cliff to the rocks called Jacobs Ladder. 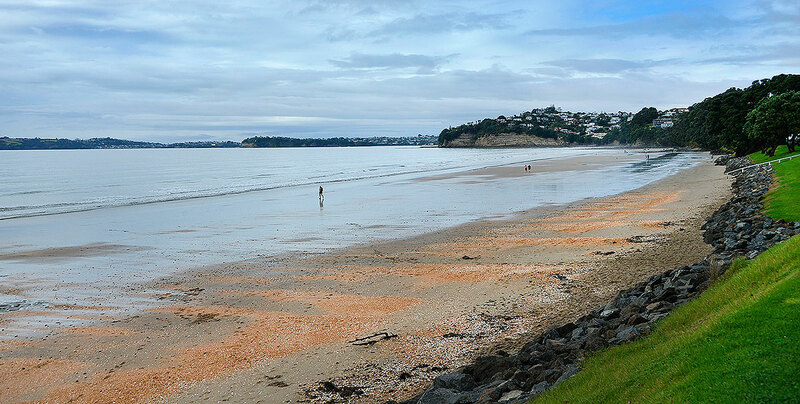 From here you can see right up to Kawau and across to Orewa. Around the other side is a direct track through to Red Beach which comes out behind the Surf Club. 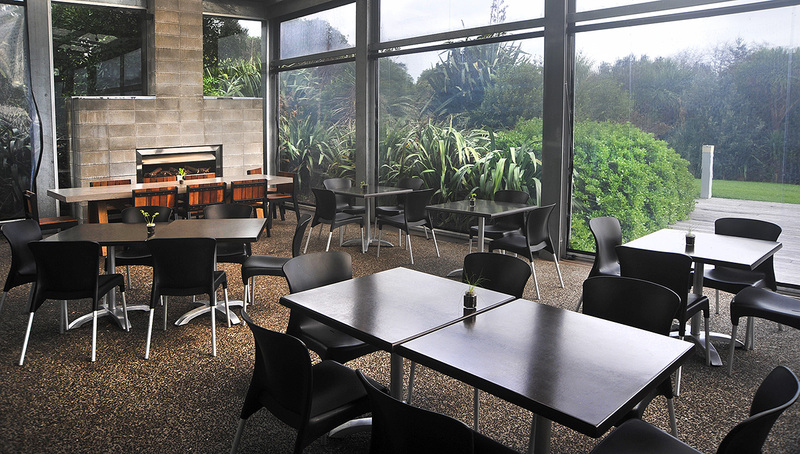 At $18 each with the NZMCA discount, its priced reasonably and is a nice place to stay and if you live in Auckland, its not far away. 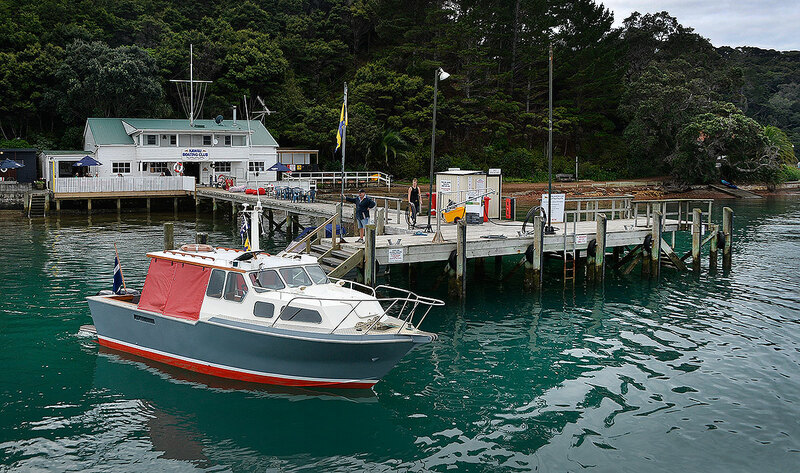 Over our boating years, both Alan and I have had some amazing moments in both Bon Accord harbour at Kawau and around Kawau so being driven around on the ferry so we could have a good look with a commentary was a real treat. Alan does one of the biggest, if not the biggest Wooden Boating Blogs around called Waitematawoodys.com and was on the Classic Yacht Association committee with me for several years. 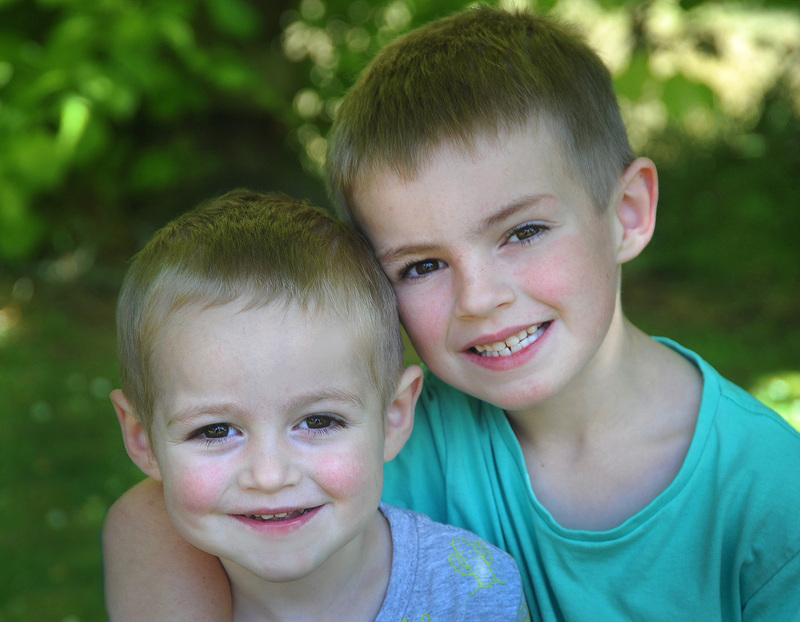 We have been known to sneak away in Rafe for the odd boys trip which are always fun! 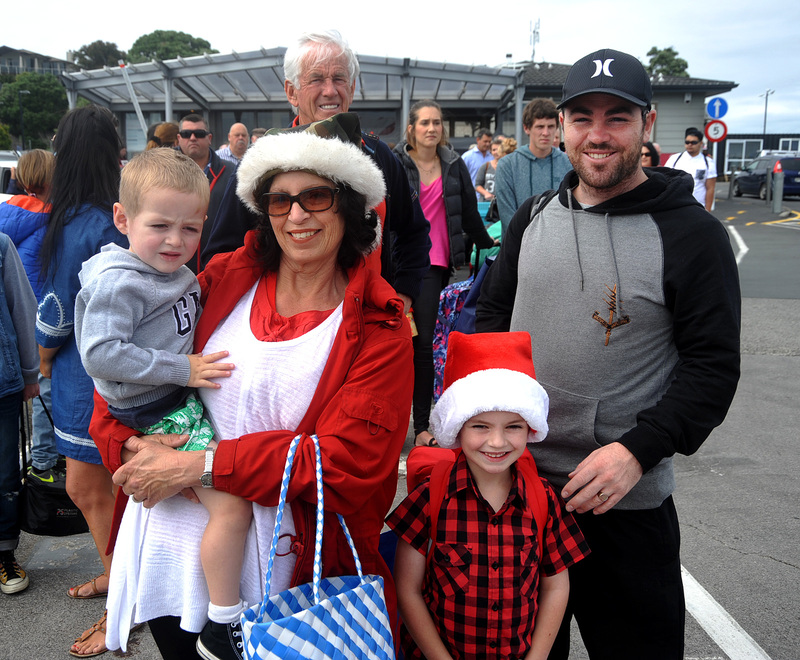 We left Rafe about 9:30 from the Sandspit Holiday Park and wandered along the road to the wharf to get our tickets and check in. 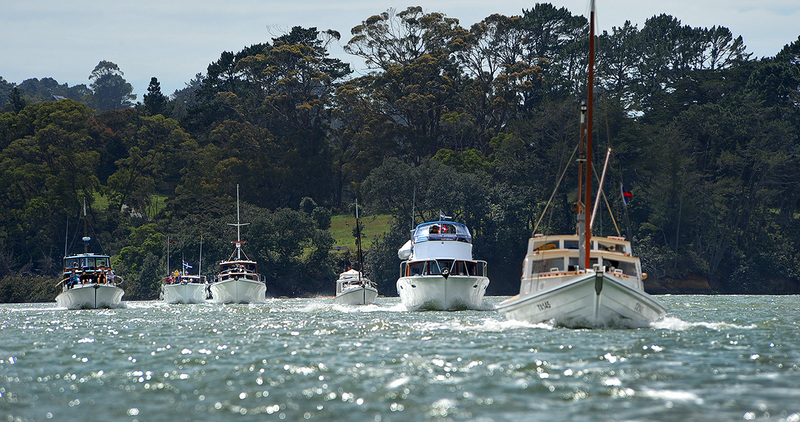 So after having a cuppa at the café on the wharf we set off about 10:30 for Kawau. 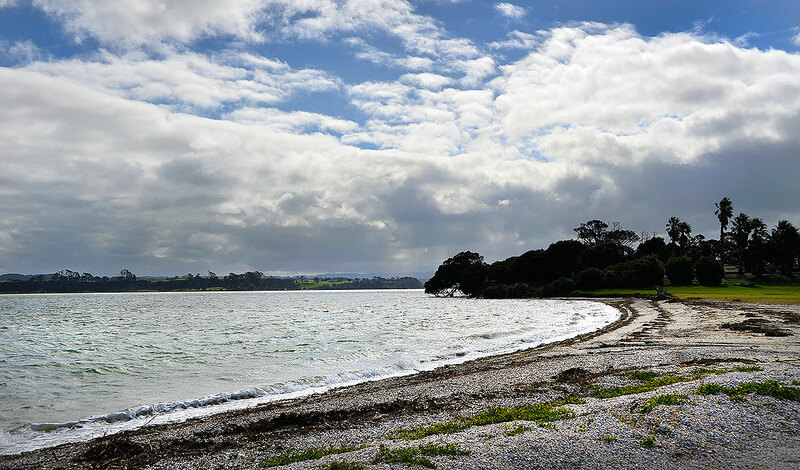 Being an Island and only accessible by boat, Kawau Island has only a handful of roads and a handful of vehicles. 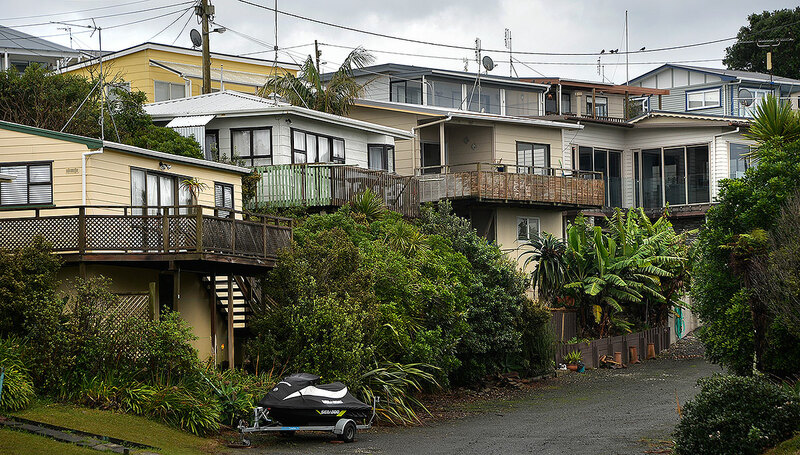 Almost all the houses only have water only access and the way they’ve been built either on top of a hill with their own chairlifts (think electric Wheely Bin on a rail 🙂 ) with a jetty at the bottom or on the water. Some of them are amazing but I suspect most would be either baches, occupied by retired folk or who don’t have to commute. We were on the Royal Mail boat which started at Vivian Bay in the north and worked its way around to Bon Accord Harbour and Mansion House Bay and then down to South Cove where there was mail to be dropped off. On the way back to Mansion House Bay for lunch, we passed the Old Copper Mine. The descent of the wheelie bin! 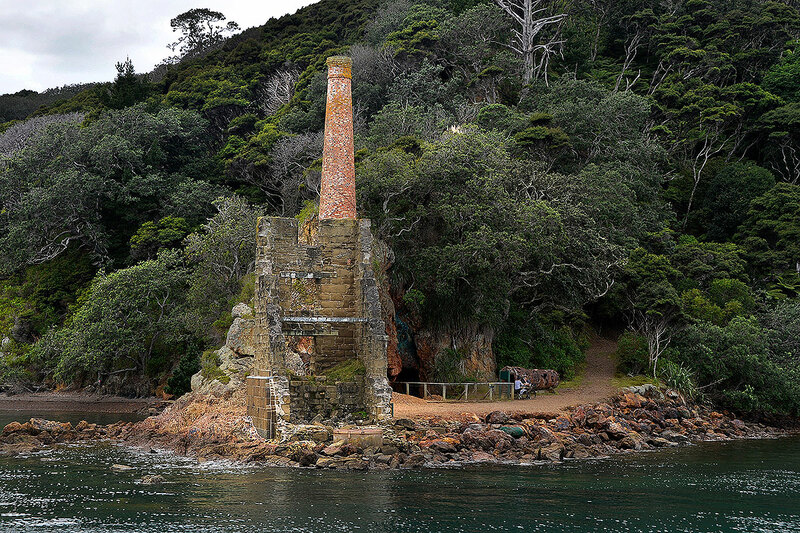 Kawau was huge source of copper in the mid 1800’s with a community of around 300 related to the Mine and its output at its peak. By the 1800’s it all fizzled out and most of the miners moved on to the Gold Fields. After a walk around the Mansion House and the coffee shop, we eventually made our way back to the ferry. It was nice barrelling along at 15 knots in the sun with a glass of Pinot Gris in hand. 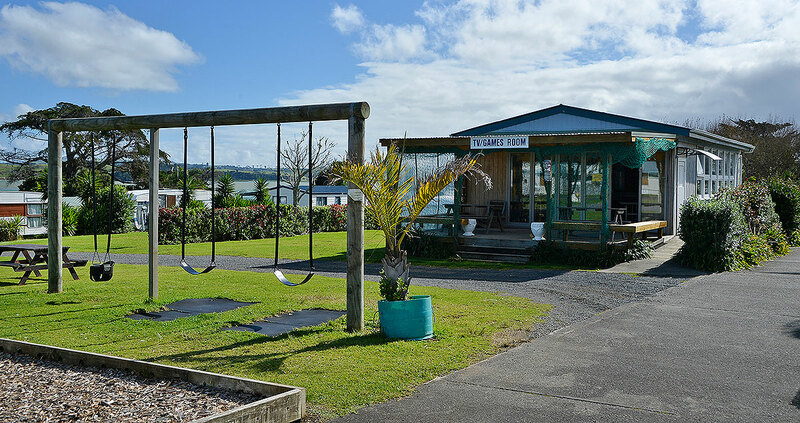 We walked back to Rafe in the Sandspit Holiday Park and prepared ourselves for a meal at Sandspit Yacht Club. They’ve had a lot of rain up here so the Sandspit Holiday Park crew suggested that we stick to one back from the water just to make sure we don’t sink! 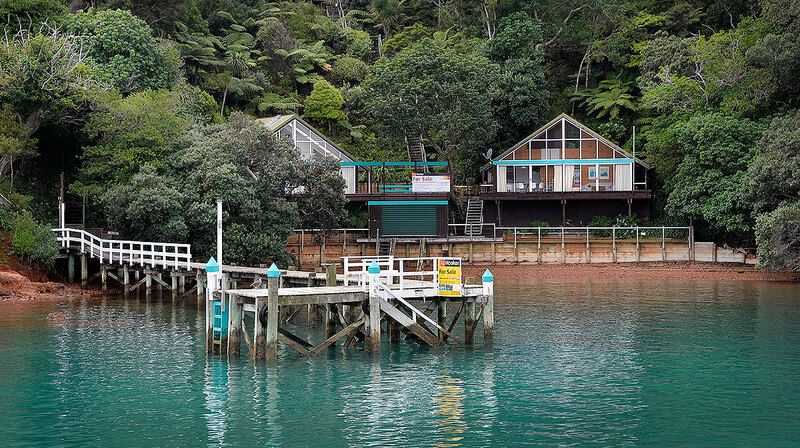 My old boating friend Alan and I were in need of some time out of the house so we decided a few days before to check out the Sandspit Holiday Park and do a trip to Kawau on the ferry. Sounded like a plan thought I so off we went early on the Friday afternoon. 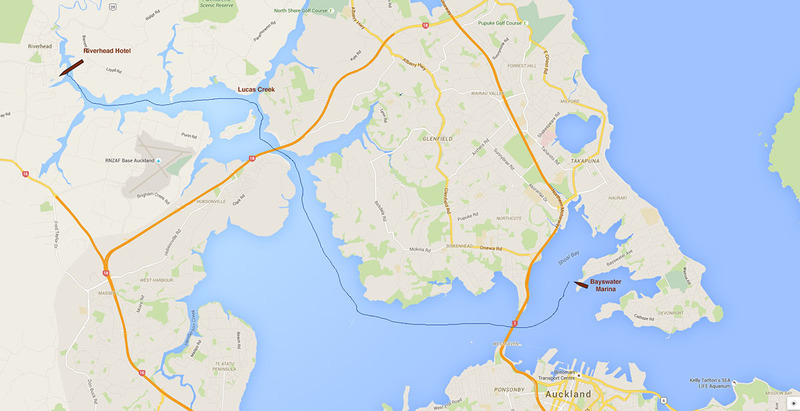 It is only 42k’s from Auckland and with little traffic, we were there at 3.30pm. 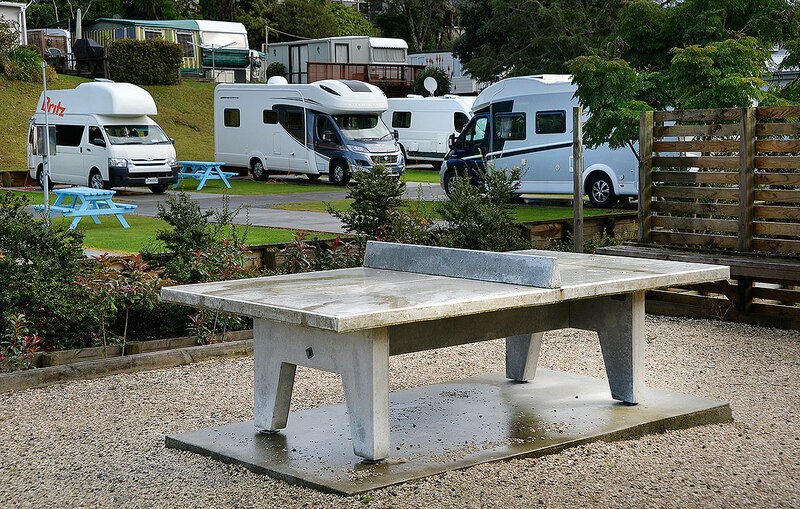 Its a lovely little park with a lot of permanent Baches and Caravans but what a neat spot. 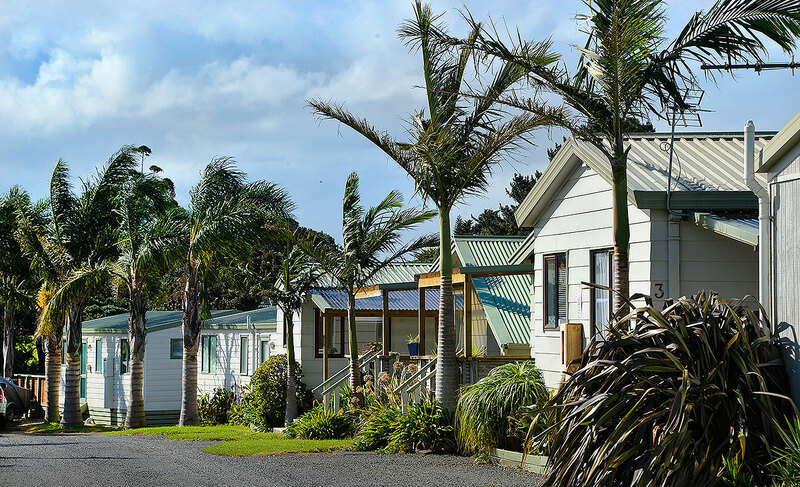 With an NZMCA discount, it was $23 each a night. 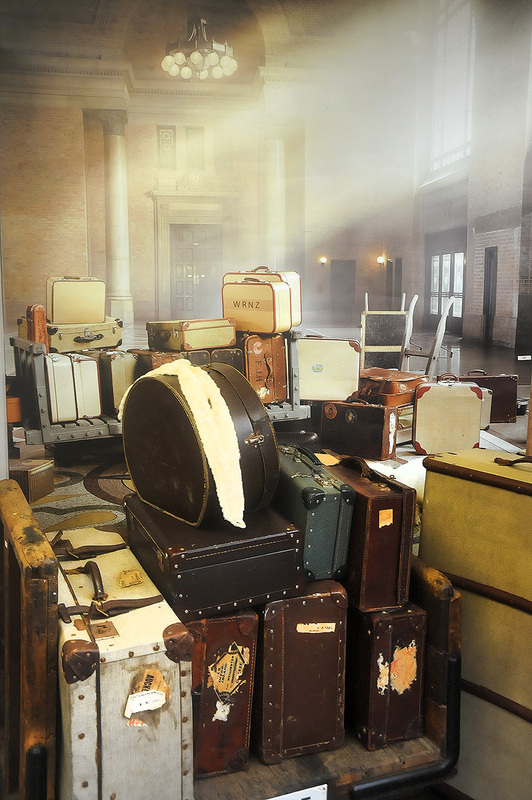 With their very new Showers and Kitchens, its a delight to stay at. There are a whole bunch of older interesting buildings there too and Horace the Morris is a feature as well. 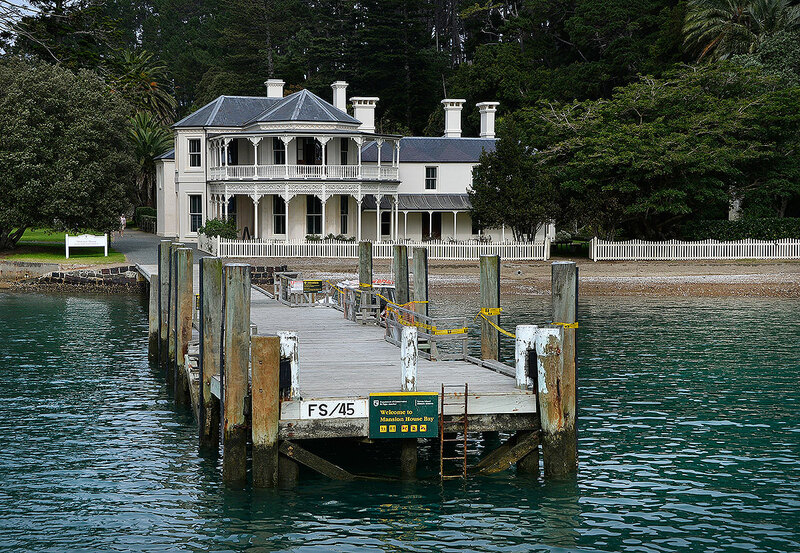 We stayed two nights with a ferry trip to Kawau in between. 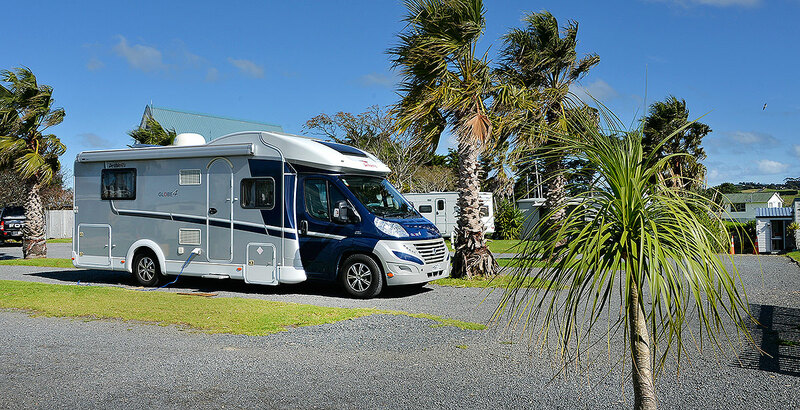 Lucky with the weather, after getting back from Kawau, we walked along to the newly setup restaurant on the top floor of the Sandspit Yacht Club and caught up with Motorhome friends Rob and Helen who live not far away from there. 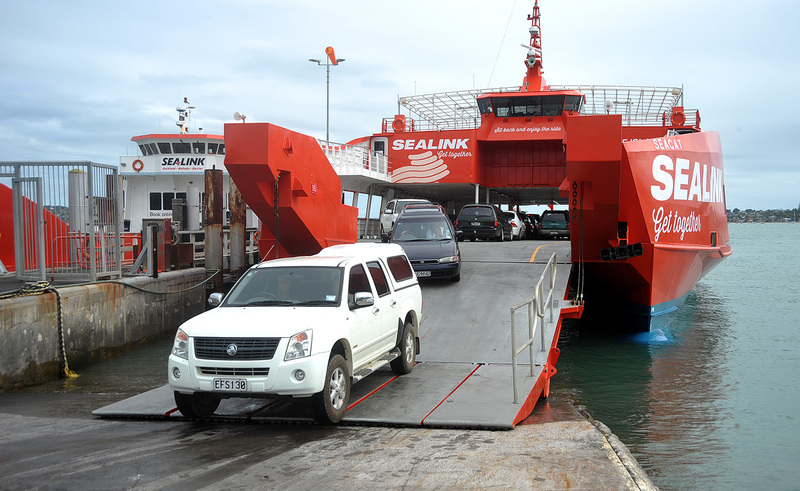 The ferry a few minutes walk away. The last time we were here, unbeknown to me, they had some issues with the drainage system for the bathrooms which used to be a real problem apparently in the height of summer. 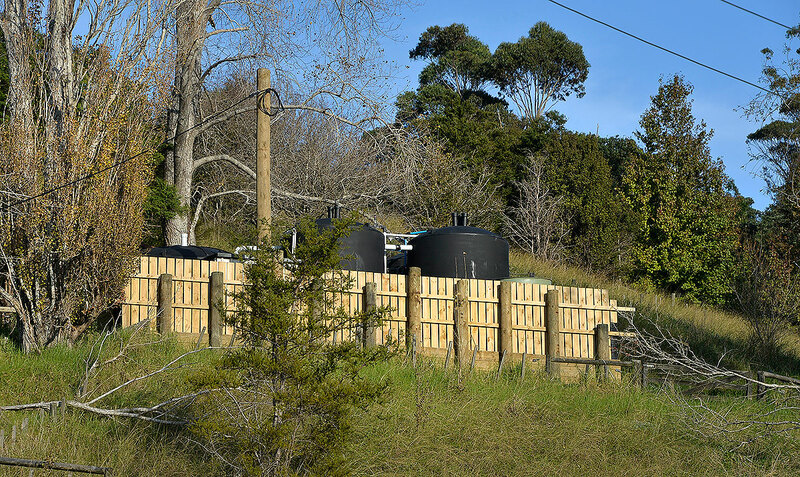 This has all been upgraded and put up the hill out of the way and hasn’t been an issue since. Nice friendly hosts who were happy to help with anything. ..
A shot from the ferry. You can see Rafe in the middle. 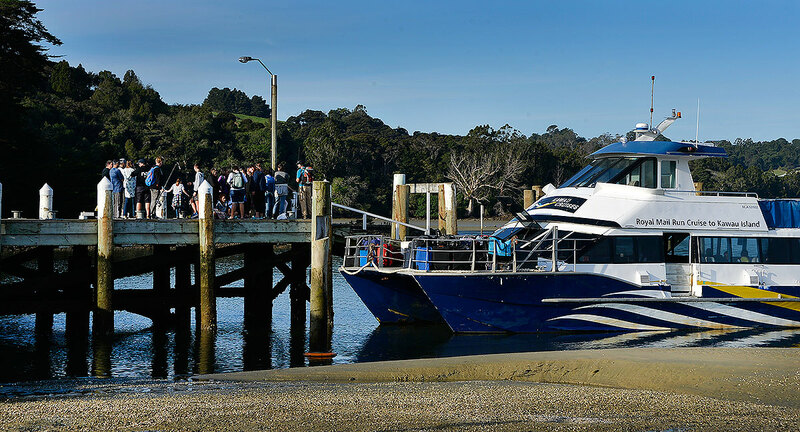 A great spot and handy to the Kawau ferry and the new Marina at Sandspit. The Netspeed Speedtest for here. I think the tower was playing up a bit as we had some difficulty with the connection over the two nights. One of the places I haven’t been to is Clarks Beach so it was time to go and check it out. 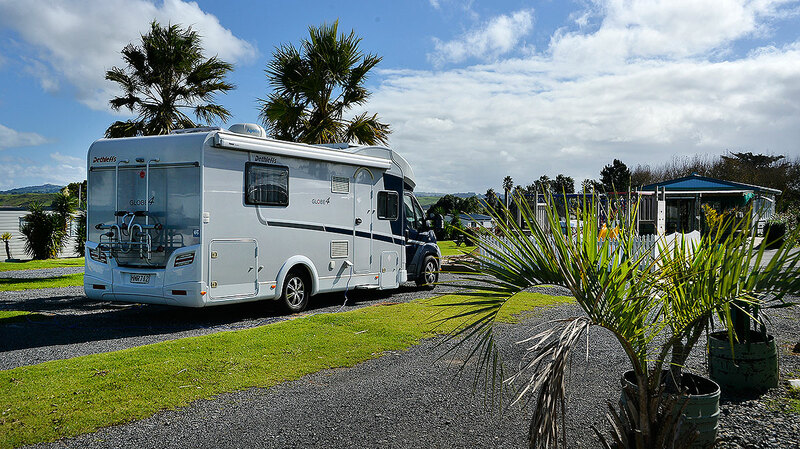 The campground has been let go for a bit but has in the last two years been taken over by some nice South Islanders, Gavin and Suzzanne and their family. Gavin has a background in Education and Suzanne in Health and both were look for a lifestyle change and they’ve definitely done that! Over the last few years, they’ve shifted and improved the Dump Station and made a lot of changes to the Laundry and Shower areas. 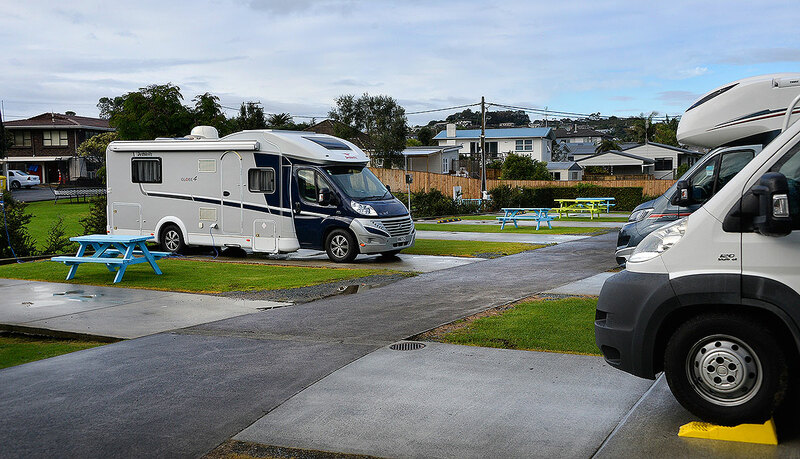 I rocked in and with the weather looking showery at best, although I was offered a spot with a magic view over the Manukau on Grass, I elected to stay on a gravel park further back. A bit of a novelty though was where I was parked was where the old dump station was so I had the privilege of having my grey water hose in there for the duration! Gavin popped in for a chat and was telling me about some of the things they had changed and some of the new things to come. I went for a walk down to the beach right in front of the camp and had a look around. A great place in the right conditions for a Kayak or even a fish. 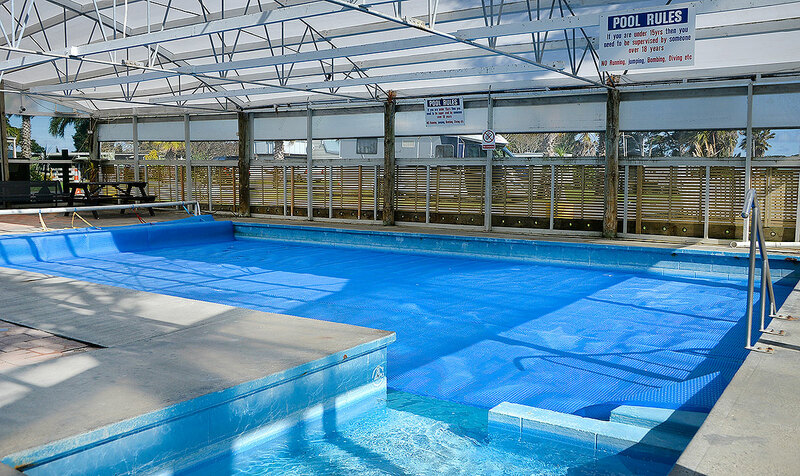 There are Fish cleaning facilities there and it is also Dog friendly with a separate pet area and there is a Golf Course right next door. 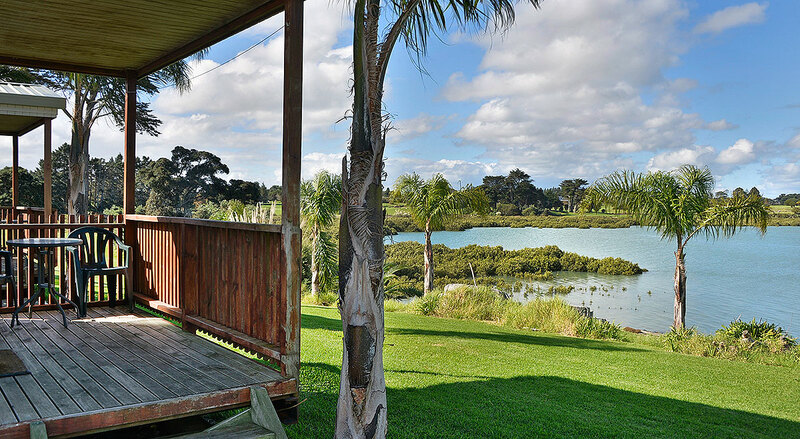 A nice spot if you want to get away from it all and not too far from Auckland either. Tim and Annette, my younger Aussie based brother and his wife had been over for the weekend but they were busy doing their own thing so we thought we’d escape from the house and head off to an Auckland City Park. 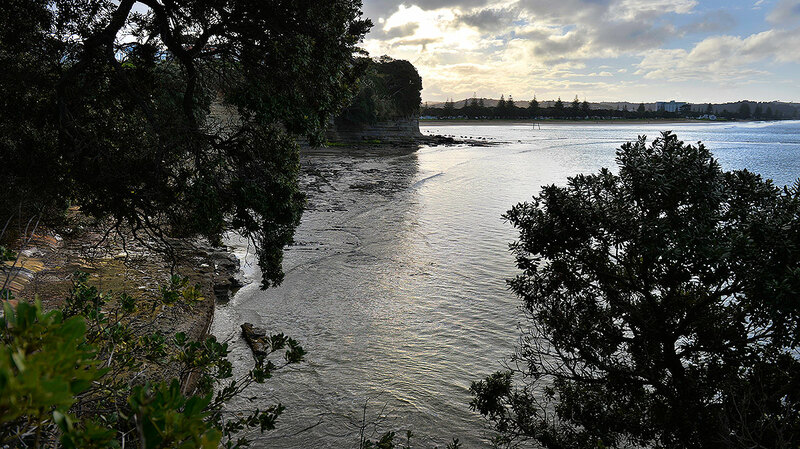 We were headed for Shakespear Park at the end of the Whangaparoa Peninsula, North of Auckland city. 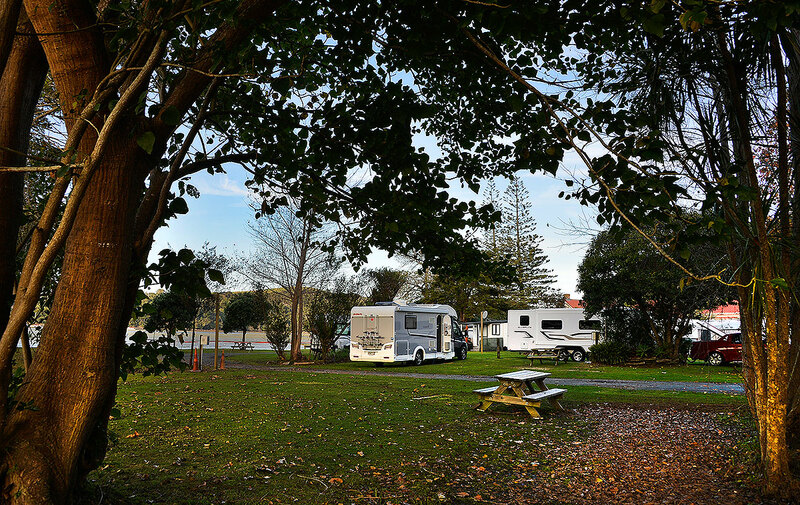 We had the last park left available as they had restricted the CSC parking to 10 Motorhomes due to the amount of water from the recent heavy rain. It was busier than I’ve ever seen it and most had opted to park on the gravel parks where they could. One of the more obvious vehicles there was Roy and Bernice Vannini who were camp hosts. While the weather was good, I went for my customary walks around to see what was happening. There was action everywhere as there were more tan 300 odd sea scouts in boats at the main camp at the other end of the beach. They were having a great time in their boats with plenty of people around in rescue craft keeping an eye on them. Others were just enjoying the beach and the park. Its a lovely spot and its the first time I’ve seen it this busy. Bernice and Roy came over to catch up which was fantastic as I’ve been following their blog over the last year or so. They’re fulltimers and have been for years in their 10m American Bus. Tons of room and they’ve done a lovely job of making it work for them. 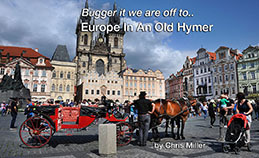 They’ve recently done a 3 month Motorhome trip around Europe so Fiona and I were keen to hear how they went and mistakes not to make 🙂 We’re heading over there in June and really looking forward to it. It sounds like they had a great trip and they gave us heaps of ideas and tips, books to read and so on. Very helpful ! Everyones on the gravel. Roy and Bernice’s Bus 2nd along. Rafe on the gravel. Roy and Bernice’s bus by the tree on the left. Shakespear is a funny place where the Internet is concerned as the first time we came here was without aerials and we got a very slow connection, useable but just ! The second time was later last year and we couldn’t get anything.. with aerials but without the patch for the aerials so I suspect they weren’t working. This time, it was pretty good for a known problem area, but we’ve got the aerials working well now but it was slow but usable and it seemed reliable. A tricky wee spot! 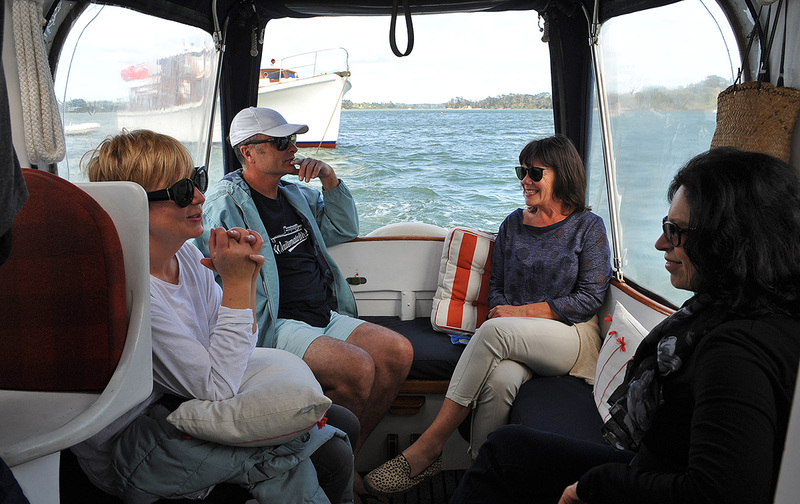 With Tim and Annette coming in for tea for their last night in NZ and after having a cup of tea in the morning with Roy and Bernice, we headed back to town. Its always nice coming to Shakespear and its so close too. 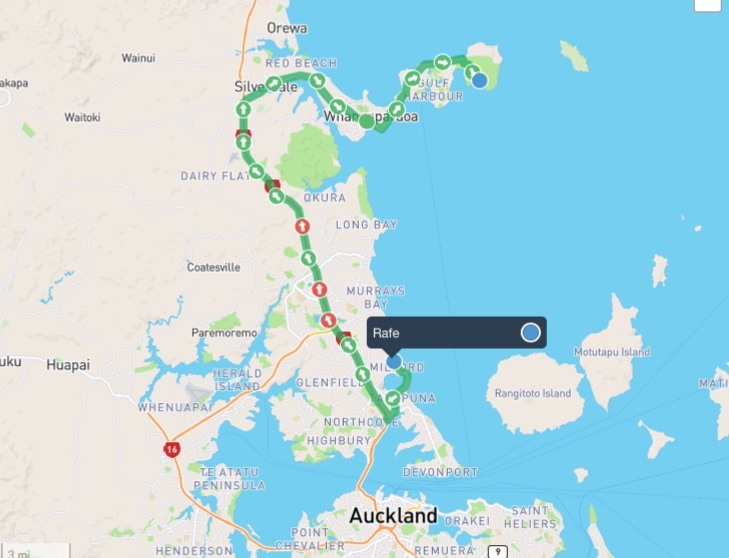 The image from Rafes Tracker. Rafes Track .. the red dots showing where I went faster than 90k! With the All Blacks losing to Ireland and the weather forecast looking miserable, you could have easily flagged the day as one for the slippers and the fireplace but when the call goes out for the Classic Launches Riverhead trip, it is one not to be missed! Fiona and I have done this for years, usually twice a year and it never disappoints. See a previous trip here. 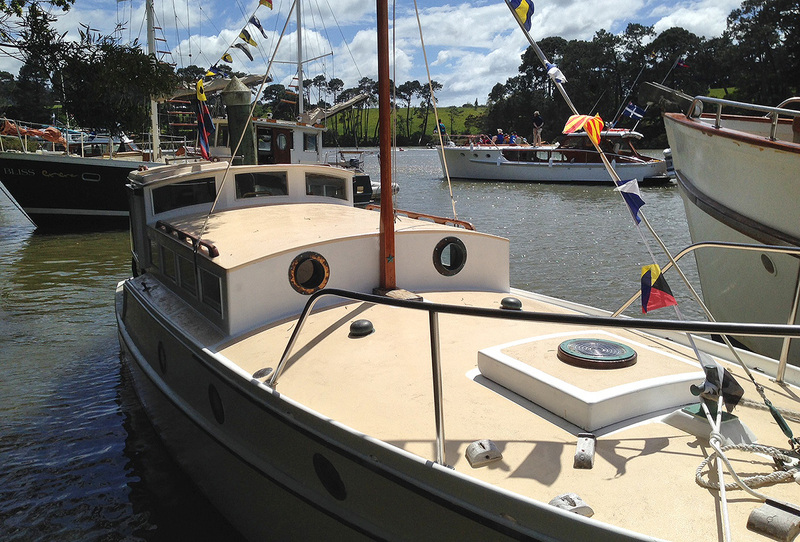 Classic boat owners Paula and Stephen Pepperill sold their Classic Yacht to renovate their newly purchased Riverhead Hotel and have done a stunning job in rescuing it after years of being run down and neglected. 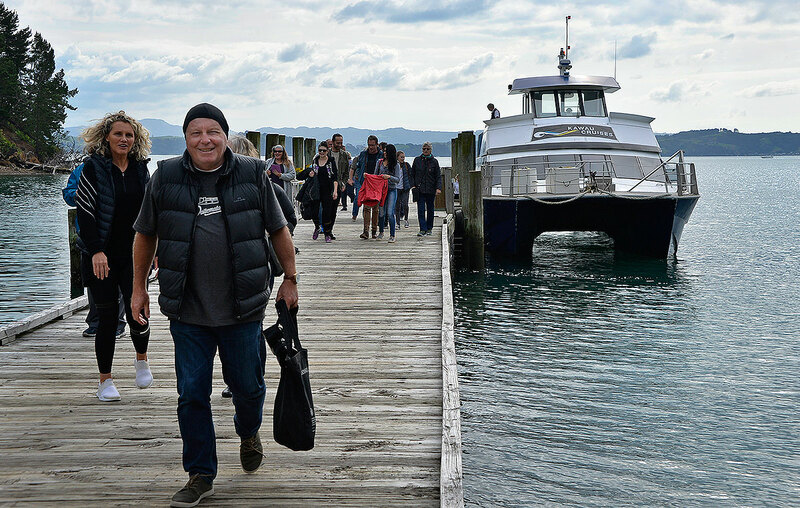 These days, ferry loads of passengers make the day trip from Auckland to have a great lunch with a few drinks and to enjoy the river trip. 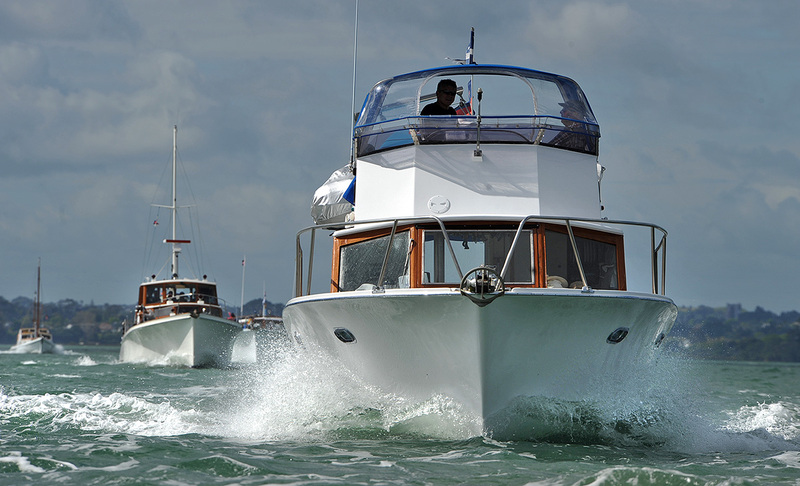 It has also become one of the more popular trips for the Classic Yacht Launches too. Where we went.. From Bayswater to Riverhead and back. Its always a fun event and can be quite nerve racking for the novices as the channel is quite narrow in places and can be only a 1 metre or so deep in places so its a great event for confidence building and to join in with a new adventure. At Lucas Creek .. half way. Dani, Grant, Robyn and Fiona with Trinidad behind. Fiona and I decided to take Rafe down to the marina carpark and stay two nights so we could get away early and stay the night after. We were meeting Alan and his wife Robyn on their 28ft 1928 Lanes tramtop at the marina at 9.00am. Friends Dani and Grant were going to be there too. 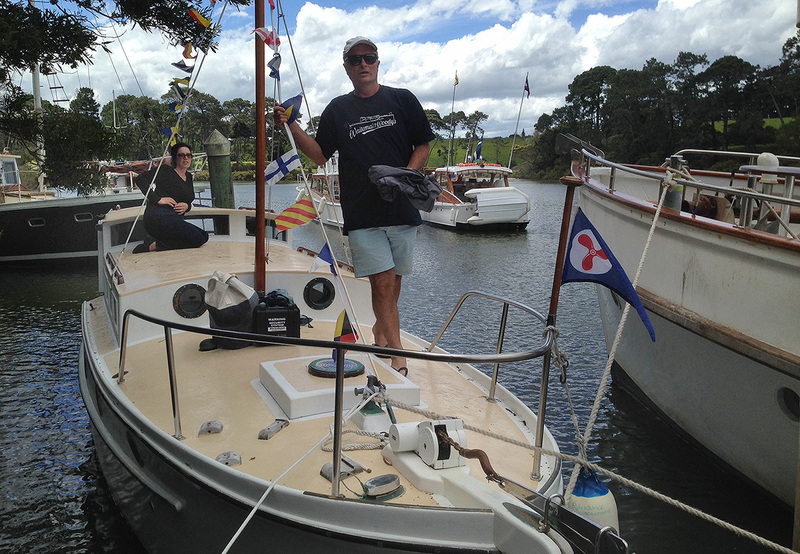 Alan was Launch Captain of the CYA (Classic Yacht Association) for 4 years after my 2 years as LC, and Alan, Grant and I have done lots of boating together when I had Rorqual. 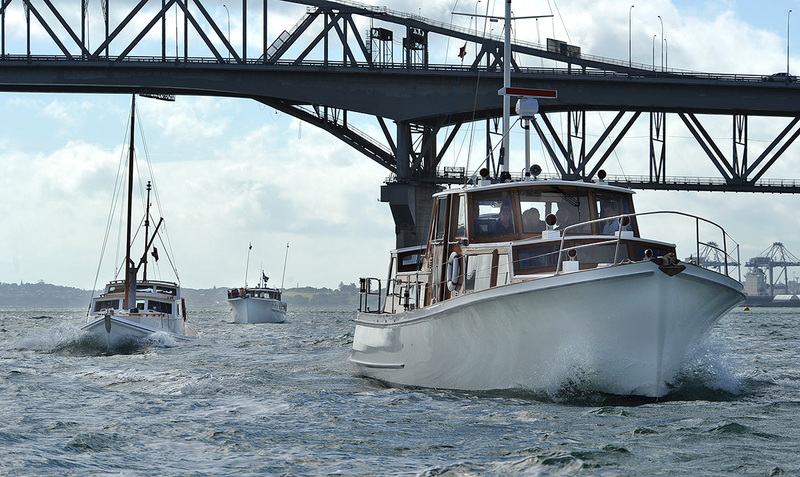 We met under the centre span of the Auckland Harbour Bridge and at 09:30, Alan led the way up to the first meeting point at Lucas creek, about half way where we were meeting several other boats and their crews. In the well sheltered upper harbour, the water was calm and there was very little wind. 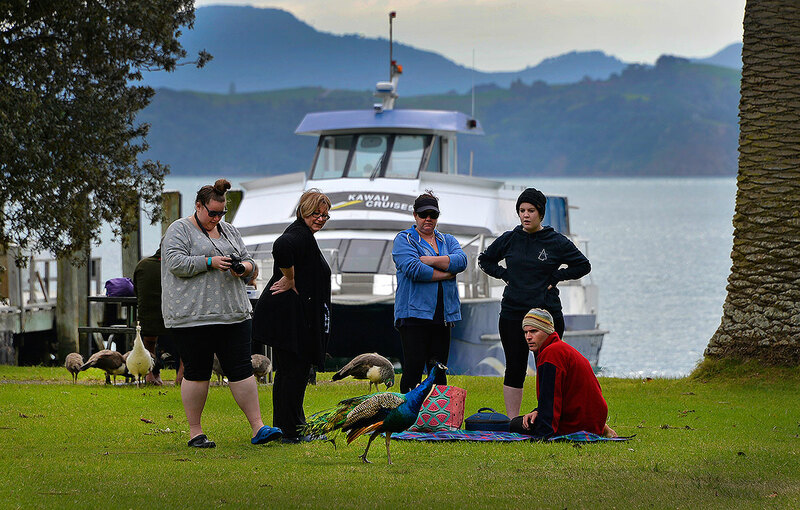 About an hour later, everyone was jockeying for a parking spot, some rafting with friends and the Tino Rawa Trust tender Whistleblower was on hand to ferry people into the Pub’s jetty. Fiona nd Robyn at the Riverhead. About 100 people turned up, some by car as well. There was a band playing, the sun made an appearance and it was a great few hours of catching up with old friends and meeting a few new people too. About 2pm (1.5hrs after full tide), many started to leave before the creek ran out of water 🙂 We had a fun trip back with a couple of drinks, some Sausage Rolls and some chocolates and strawberries which Fiona had prepared. Time to go, Grant standing and Fiona sitting waiting to go. We stepped off the boat to a hot shower and a cup of coffee after a neat day out. Thanks for a great day out on the water Robyn and Alan, and its always fun to see Grant and Dani too. The forecast was definitely sorting out our location for us this weekend.. Parakai so we were plugged in for the heat and close to the pools. Parts of the Hawkes Bay was without power and roads were closed everywhere with snow. Somewhere warm and close by was the order of the day. 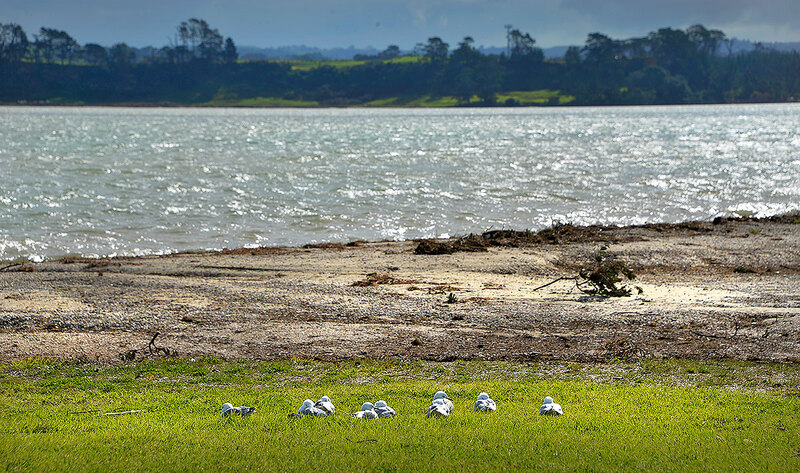 The last time we were at Parakai, it was hosing down and there was mud everywhere. It was very much the same this time except we were lucky in that we got to see a lot more of the sun but jeepers it was cold! Muddy bits roped off. All the grass was muddy. Gary and Chris’s Fuso next to us. The latecomer with his wheels down next on the right. One of our neighbours who arrived later in the night missed the concrete strips (easy to do) and his rear dual wheels were a good 4-6 inches down in the mud. The pools were fantastic and it was nice to see our fulltiming friends, Gary and Chris again after their trip up North. I had just bought a new toy through the Noel Leeming / NZMCA discount scheme. It was a Philips Induction plate and what a little beauty. I’d just put enough frozen peas in the pot for four with some warm water. Then I hit the go button, wow, I wasn’t timing it but it wouldn’t have been much more than a minute and it was ready to eat. Then we did the steaks in a Staub pan while the girls were getting some chips from over the road. These took a lot longer and as its so easy to control the heat, better cooked and quicker than gas. Well worth getting. After a good feed, we blobbed for a while and then went for a swim. Later, Chris made some nice scones for tea and we had a couple of glasses of Italian red to finish the day. 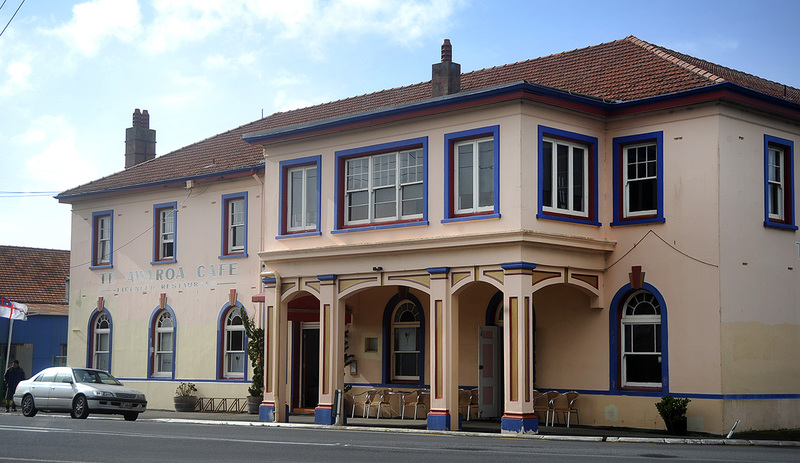 the next morning, Fiona was keen to re visit the Antique shop at Helensville railway station so we went around there and quickly checked out the Railway Museum and café for a cuppa. Gary and Chris headed off for Rays Rest and we headed home. 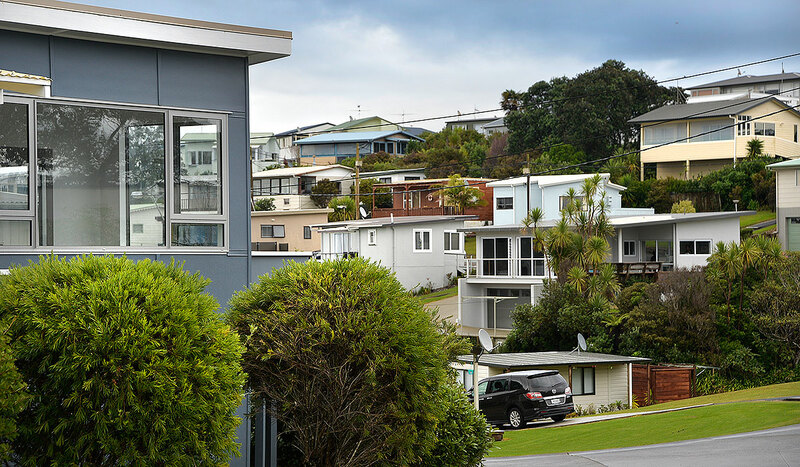 A nice weekend and despite the cold, Parakai definitely looks better when the sun is beating down. Heading back to Auckland after a great weekend in the Helensville area, we stopped at a place called Provenance which we’d been to before a long time ago when it was Beesonline. 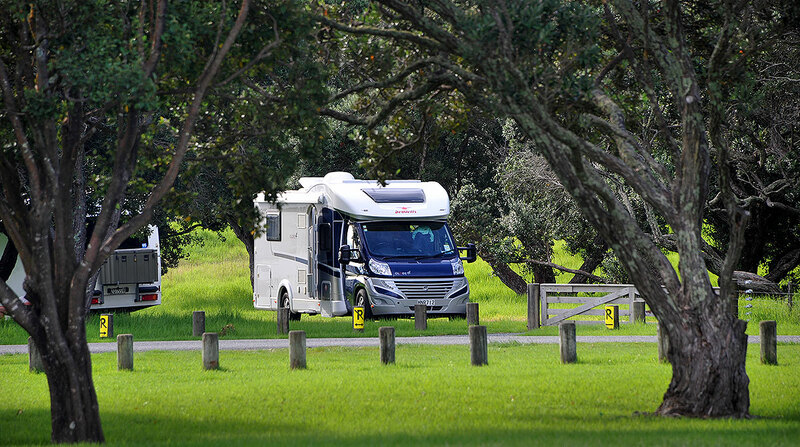 A huge carpark which makes it easy to get a Motorhome into and a very park like environment with a bridge to get to the Café. When we went there, there had been thunderstorms the night before and the weather had been misbehaving badly so the pictures don’t show it at its best. I imagine their outdoor areas would be nice in the sunshine. 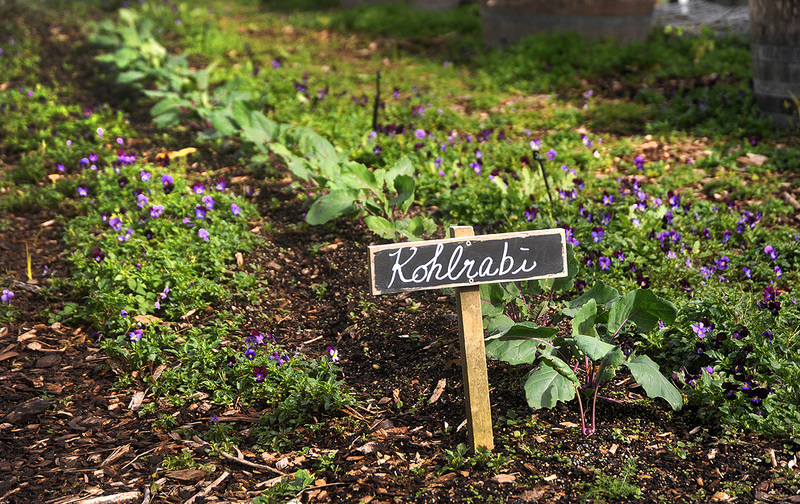 It was also really interesting to see they had a huge garden where they grow a lot of there own veges and herbs. Someone knows how to grow Lemons! They also have about 10 or so absolutely laden Lemon trees. Someone here knows what they’re doing. There was a big fire raging when we got there and it was all very warm and toasty inside despite the weather and we sat down and ordered some lunch. As I was still nursing my implanted tooth, I went for a mushroom penne type of meal and Fiona had the same. It was just amazing. 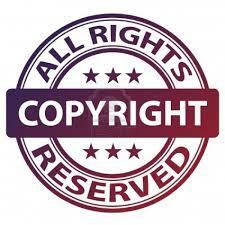 When it was Beesonline, it was very popular and its good to see the same high standards still apply. 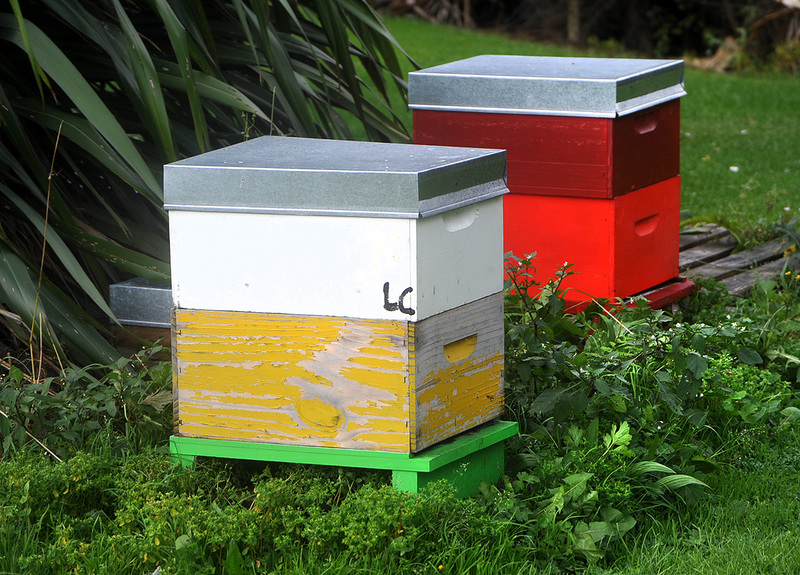 They still have some hives out the back too. 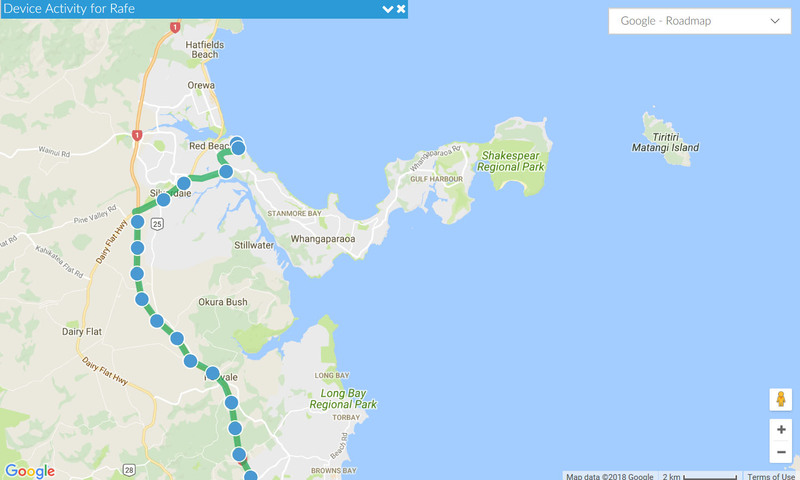 If you’re heading out west to Muriwai or beyond, it is just on the left before you get to Waimauku on the main road. Before we enjoyed a great lunch at the Helensville Railway Station Cafe, we visited the Helensville Train Museum right next door. 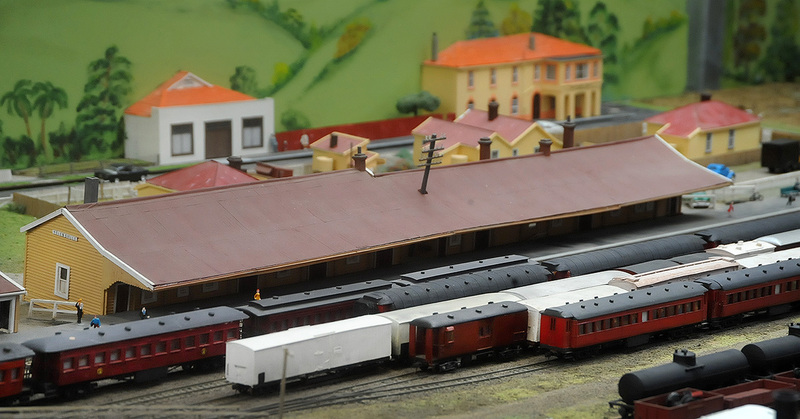 Run by the Helensville Railway Station Trust by volunteers, this is well worth checking out. The chap that built the model spent 30 years putting it together. After spending an hour or so, checking it all out, one of the volunteers came over and said to me, “come and check this out, I’ll demonstrate it for you”. There were two red boxes with buttons and bells. This was The Tyers Tablet system which railways in both Great Britain and New Zealand used up until 1994 on single lines to prevent head on collisions. It involved a sophisticated coded bell system with switches with electromagnetic locks that allows a small disk, a Tablet, to be released for a train driver when the line is clear. The system was setup between railway stations at each end of a line. Given that it was setup in the dark old days of bleeps over the phone lines, it’s a clever system. 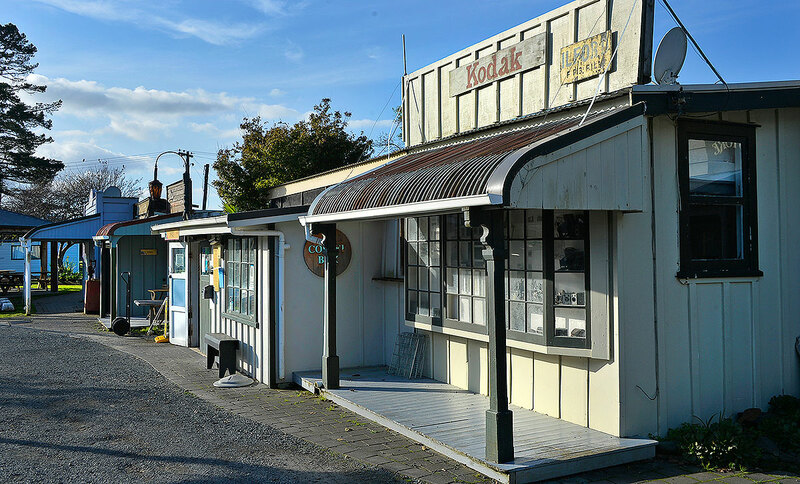 Helensville Railway Museum is the only one that we know of still in working order and when you think of what it had to do and when it was invented, it’s pretty clever. 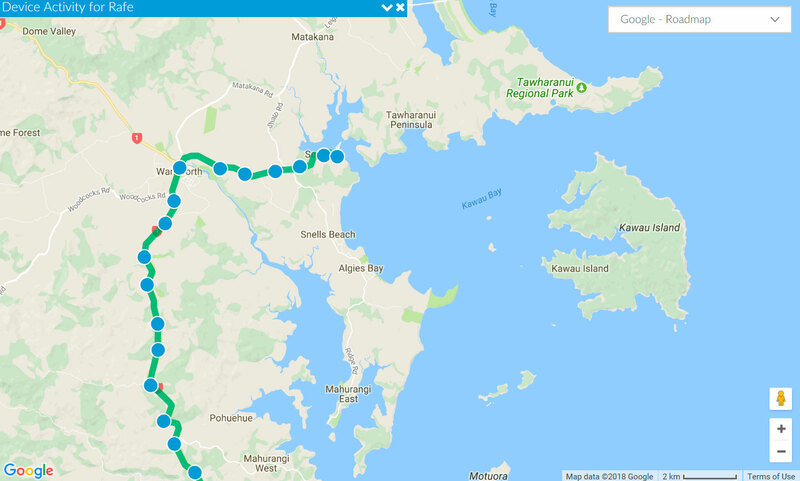 If you want more info on this, Here’s what Wikipedia has to say about the Tyers Tablet system and here’s a youtube vid of the Helensville setup being explained. The two volunteers there were only too happy to show me everything at the museum and couldn’t have been more helpful. It’s a must do if you’re in town. It’s $3.00 each and well worth it. On Christmas eve, we stayed in my sons family’s driveway and early Christmas day was spent opening pressies with Alex, Sarah, the two grandsons, Ayden and Liam and with Sarah’s parents and brother Andrew. The hard part was keeping Liam on task opening all his presents as he wanted to stop and play along the way. All part of being a 3 yr old. Waiting for the ferry at Half Moon Bay. Liam with Fiona and Ayden with his dad Alex. After Fiona had made croissants with Cheese and Bacon .. yum! 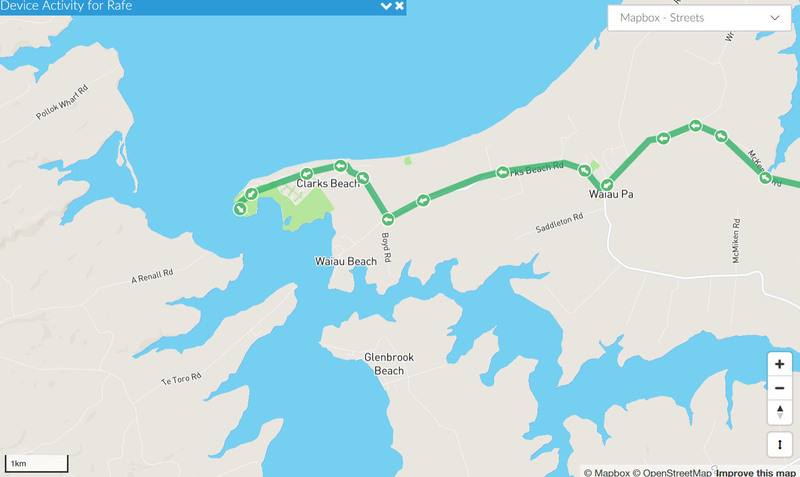 we left to catch the ferry from Half Moon Bay to Waiheke, where were to have a great lunch with the wider family at Fiona’s sister Sara and Robs place in Onetangi. Rob has some new toys in his toy box at the barn so after lunch we went up to the barn and he wheeled out the entertainment. The Razor: a 4 wheel drive farm bike with roll cages but souped up mechanically. The Shredder: A track driven by a petrol motor steered by a wake board like setup.. see the piccies. Remember too to click on them for hi res. Lots of fun mixed with some nice wine and great food with great company. We all made it too the 7pm ferry at Kennedy point in time to get back to Half Moon Bay and to Ardmore. It was a big day and I was literally falling into bed when I got back to Rafe. 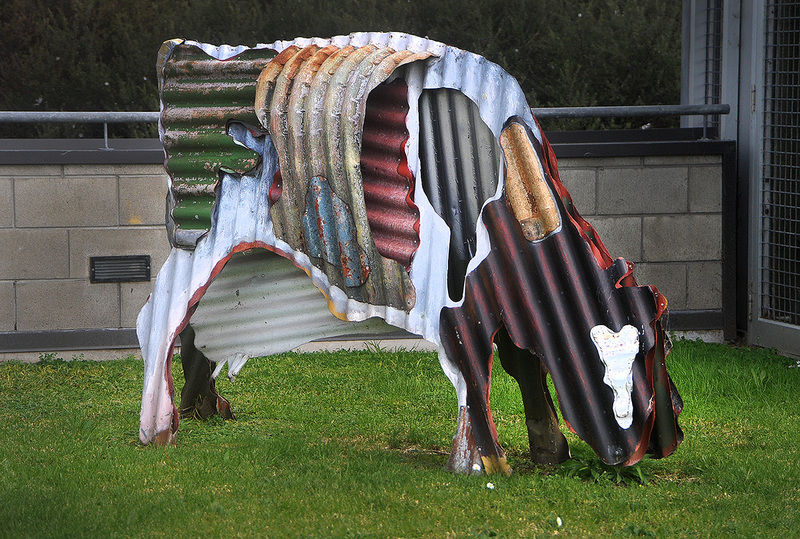 We’re looking forward to heading up North for the next week .. watch for some Northland posts! I hope everyone had a great Christmas.. have a good new year and if you’re on the road, be safe.